Have you mastered the volleyball set? Regardless the position, every player needs to learn to set a volleyball. No matter how your body and hands are positioned, skills for setting should be consistent. That is, your hand technique for playing the ball should be the same every time you attempt to set. With your hands down in front of you, put all ten fingertips together (thumbs touching each other, index fingers touching each other, etc) with the fingers spread wide. Raise your hands up above your head with your fingers still touching. Pull your elbows out to your sides. Pull your hands apart just far enough so that a ball fits between them. The fingers are the only part of your hand that touches the ball, never the palms. Your thumbs, index fingers, and middle fingers are what you use with your wrists to catch and push the ball. The little fingers and ring finger just give you extra control when setting. Toss the ball to yourself, then just catch the ball with your hands in the correct position. Catch a ball in the correct position. After a pause, continue through a setting motion. Concentrate on catching the ball with correct hand positions and gradually make the pauses shorter. As you're setting, focus on taking spin off the ball. The best setter's move in a direct line to the ball and deliver the set efficiently to the hitter. Setters should explode to the ball; arrive early with the hands up. When youre at the target waiting for the pass, have your bodyweight on your right foot ready to take a step with your left in the direction of the passed ball. If you have accurate passers, a setter can get into position quicker by taking a big right step to the spot the ball is being passed. After that big step, pivot squaring up to the left antennae. Even if you are slow, you can still develop good footwork to get to the ball faster than other setters with poor technique. 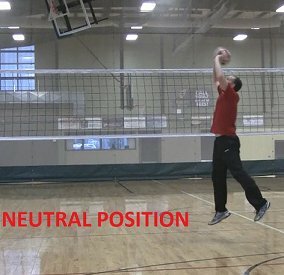 Setters should emphasize getting to the ball first before focusing on setting technique. If you cant run and get to the ball quickly and efficiently, setting the ball is going to be much more difficult. A common mistake beginning setters make is running after a ball with their hands up in the air. Although I agree you should get your hands up early ready to volleyball set, you should use your arms first to move to the ball. The best way to develop consistent sets is facing your target every time. A good rule of thumb is to always face the left antennae when setting. Use both your arms and legs to guide the ball and follow through with both hands pointing towards the target. Good setter's often make attackers look good just from being able to deliver consistent sets. Setters need to really concentrate on contacting a ball cleanly when setting high outside. The farther the ball needs to travel, the more likely you are to double contact with your hands. There is a longer hand contact on the ball. The ball is in the air a longer time, allowing for the referee see the rotation of the ball and think about possibly call the set. If youre having trouble setting the ball far enough outside, really focus on powerfully extending your arms and hands through to the target. Setting a short quicker set can be done by just using a quick wrist action. This is best done with a less follow through (or no body extension). These sets can be easier because there is less body movement. The set is performed mainly by the wrists. It's important to note that no two setter's set the same way. Regardless of your skills, what's important is that you get the job done. Therefore, it may be best for player's to experiment with different strategies for setting to develop their own unique setting technique.